Thousands of unlucky South Jersey residents were still without electricity Monday morning, six days after a violent storm knocked out power. Yet one local firm says customers could use its product to turn the lights back on, while they wait for utility providers to make a fix. “We really think you should be able to have power whenever and wherever you need it,” said Heather Farber of NRG Home, which has offices in the Science Center in University City. According to Philadelphia Business Journal, NRG Home, a division of Princeton, N.J.-based NRG Energy Inc., offers consumers several solar powered generators – something that may appeal to the more than 4,000 Atlantic City Electric customers who were still without electricity mid-day Monday. “It is clean and quiet, and you can put it in your house,” said Farber, who calls the solar powered generators a better option than traditional gasoline powered models. Companies and consumer advocacy groups regularly warn the public against using gas powered generators indoors since it puts residents at risk of carbon monoxide poisoning. NRG Energy began offering the portable, fume-free generators after acquiring Goal Zero last summer. The line includes three options, the Yeti 150, Yeti 400 and Yeti 1250 – each providing a different number of hours worth of power. 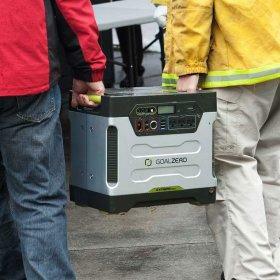 Goal Zero introduced the Yeti 1250 in 2012, and the other two solar generators followed in 2013. The Yetis’ retail price ranges from around $200 to nearly $1,600, price points that cost the consumer hundreds of dollars more than the gas powered generators that support the same watt hours. But Farber points out Yetis do not require any fuel, which over time will up the expense of the gasoline versions. NRG Home declined to provide specifics on sales, but the company did say the 400 is the top seller. Atlantic City Electric said it expected power to be restored by the end of the day to its customers, although frustrations already boiled over for many residents and at least one Gloucester County leader after nearly a week in the dark. The Greenwich Township mayor called for Gov. Chris Christie to do more to help his community. Christie said Friday FEMA officials were on the ground and will determine if federal relief is needed by Tuesday.